I have just posted a short video that shows some new productivity features implemented in VisuMap version 3.0. 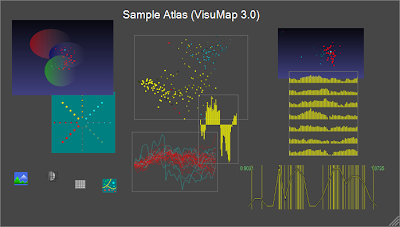 The newly released VisuMap software version 2.7 has added the kernel PCA (kPCA) service. From the user's perspective kPCA basically provides the same service as MDS methods, namely maping an abstract set of data points with a similarity distance to a multidimensional vector space, so that the Euclidean distance in the dimensional space somehow reflect the original similarity distance. Thus, the input for kPCA is a dataset with a similarity distance (or matrix), the output is a table of numerical values with one row vector for each data point. As there are many effective analysis methods operating on dimensional vector space (like k-mean clustering, support vector machine), kPCA enables us, like MDS, to apply effective methods to a broader range of data. The first few seconds of the video shows how the first 3 dimension re-constructs the original sphere. Then, each time when the z-axis switched to another dimension, the sphere turned in to another geometrical shape. I am not sure how those geometrical shape get formed and how to take advantage of those new dimensions. But, those dimensions surely look interesting and a little mysterious.